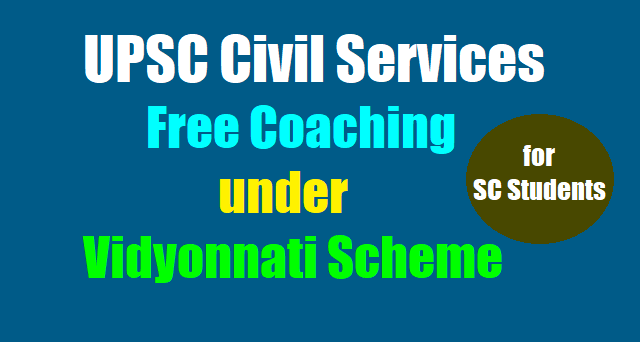 Civils Free Coaching to SC Students: GOVERNMENT OF ANDHRA PRADESH, Social Welfare Department – Scheduled Caste Sub-Plan (SCSP) - New Scheme -“NTR Vidyonnathi” for Providing Professional Guidance for Civil Services Examinations for SC students in the State of Andhra Pradesh – Sponsoring of meritorious SC candidates to reputed private institutes – Sanctioned – Orders – Issued. From the Commissioner of Social Welfare, A.P., Hyderabad, Lr.No.S1/2495/2014, dated:03.12.2014. The Government of Andhra Pradesh has enacted the SCSP/TSP (Planning, Allocation and Utilization of Resources) Act (Act 1 of 2013), which came into effect from January 25th, 2013. The purpose of SCSP/TSP Act is to reduce the gaps in the development of SCs and also to facilitate access to better livelihoods and employment opportunities to the Scheduled Castes, especially the educated youth. 2. In order to ensure SC students reach the higher echelons of administration, there is need in Andhra Pradesh to facilitate their entry in Civil Services, which is through the mode of the annual Civil Services Examination conducted by the UPSC. The entry of SC Students in the higher Civil Services will enable them to participate effectively in the decision making process in the highest level and also boost their morale and also ameliorate their sense of deprivation and alienation from the development process. 3. It is also observed that the trend is that the students from the economically poor Scheduled Castes families have not been faring well in the Civil Services Exam, especially during the last 6 to 8 years. 4. Government, after close study of the practices followed in other States, hereby decides to sanction the new scheme “NTR Vidyonnathi” for providing Professional Guidance for Civil Services Examination for SC students with an outlay of Rs.5.07 crores to conduct 3 guidance programs under the scheme. The scheme will come into operation during 2015-16. The expenditure under the scheme shall be met from SCSP budget of 2015-16. 5. The guidelines, mode of selection, the other details of the scheme, are hereby appended as annexure. 6. The Commissioner of Social Welfare, Andhra Pradesh, Hyderabad, shall take further necessary action accordingly.